by Patrick L. Barry of Space, Inc.
Nov. 15, 2002: Times have changed since the days of Sputnik and Apollo. Back then, the only players in the space game were the United States and the Soviet Union. You had to be a superpower to deal in space. Today, anyone can do it. You can now buy stock in dozens of companies that offer space services on the open market. Based in countries such as Japan, Australia, and France, these companies will launch a payload into orbit for you or, if you want to go into orbit yourself, they'll reserve a seat for you on a futuristic "space plane." A viable space-tourism industry is, however, decades away. Meanwhile, companies have been launching payloads commercially for years--it's old news. The real cutting edge of space commercialization today is on a third front called "remote sensing." Orbiting remote sensing satellites gaze down at Earth using their science-caliber sensors to document all kinds of important phenomena--for example: urban sprawl, water pollution, and coastal erosion. The data they gather have revolutionized the way earth-science research is done, and they offer new perspectives to decision makers facing global problems like deforestation and climate change. 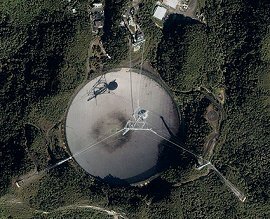 Believe it or not, this image of the Arecibo radio telescope in Puerto Rico was taken from more than 400 miles up! Space Imaging's IKONOS satellite snapped the 1-m resolution photo. Copyright Space Imaging. The job of building, launching, and operating these satellites has traditionally fallen to government agencies such as NASA and the European Space Agency. Now, however, NASA is helping private companies get into the game. "The Commercial Space Act of 1998 encouraged NASA to buy remote sensing data from private companies whenever that data would meet the agency's needs," says Vicki Zanoni, an engineer at NASA's Stennis Space Center in Mississippi who leads the center's efforts to understand the quality of commercial satellite data. In other words, companies can enter the commercial remote sensing market knowing that there are at least government customers to vie for; it's mandated by law. The idea is to give the industry a boost and thus advance this frontier of space commercialization. But as in any open market, buyers will only purchase products that meet their needs. When shopping for data, NASA must be able to squeeze the tomatoes and thump the melons, so to speak. It needs to be sure it isn't getting rotten data. "The government is purchasing commercial data to potentially support global-change decisions, intelligence decisions, and homeland-security decisions," Zanoni says. "So we want to make sure that the data we're purchasing are accurate. And the best way to do that is for the government to independently verify it." That's why NASA is pooling its talents with the U.S. Geological Survey (USGS) and the National Imagery and Mapping Agency (NIMA) to put commercial data to the test. Their collaboration is known as the Joint Agency Commercial Imagery Evaluation Team, or "JACIE" for short. 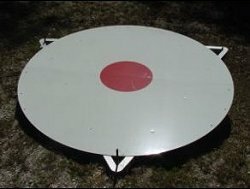 Scientists place 2.44m-wide "geodetic" targets like this one at precise locations in open fields to help test the accuracy of commercial remote sensing satellites. Image credit: NASA. JACIE members test data in many ways. For example, when a commercial satellite of interest passes over Stennis Space Center--the NASA center that initiated and participates in JACIE--scientists lay out very large, custom-made tarps in an open field. These tarps reflect a specific, known amount of light, so looking at them in the resulting satellite image tells scientists how accurately the satellite measures reflected sunlight--an important variable for climate science. Other tests involve placing 2.44 meter-wide "bulls-eye" targets in a grid pattern in a field and using GPS to pinpoint their latitude and longitude to within a few centimeters. These then show up in the satellite images as reference points that scientists can use to check the satellite's geopositional accuracy. After the tests are performed, "we then can say with confidence that our scientists can use the commercial data in the way they intended to, or we can advise them on how best to use the data," Zanoni says. That confidence, which is vital for doing credible scientific research, assures that these government agencies will continue turning to the fledgling commercial remote sensing industry for their data needs. And that, in turn, takes the commercialization of space "one giant leap" forward.